* Advantage - The Flea Specialist. 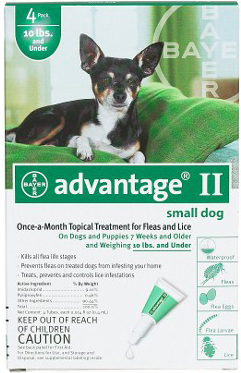 * Advantage Flea Control is a monthly application that kills 98% to 100% of fleas and their larvae within 12 hours. * In addition, re-infesting fleas are killed within 2 hours. * Kills fleas before they have the chance to lay eggs - thus breaking the flea life cycle. * Effective up to 6 weeks. * Advantage is applied to the back of the neck on cats and between the shoulder blades on dogs. * It spreads naturally on the skin surface at the hair root level, aided by body movement to provide whole body coverage. 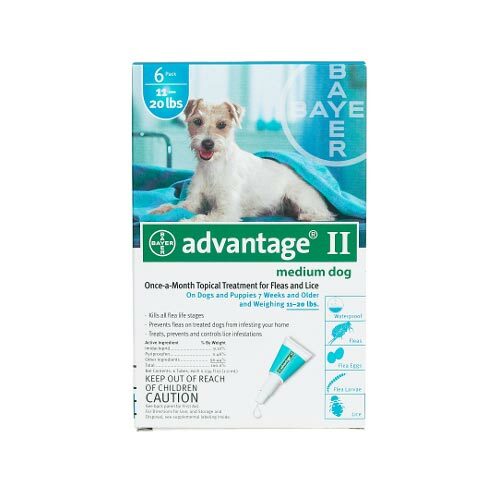 * Advantage is water-resistant flea medication, so it continues to kill fleas even after shampooing, swimming, rain or exposure to sunlight. * Advantage is for dogs over 7 weeks old. * Do not use dog products on cats or cat products on dogs.